If you have been a following for some time on this blog, you will know that Catan is the game that started it all for me. It is one of my favorite board games and definitely one of the my favorite digital board games too. Well the folks behind Catan have gone and basically rebooted the whole Catan family of games (the online aspect only). 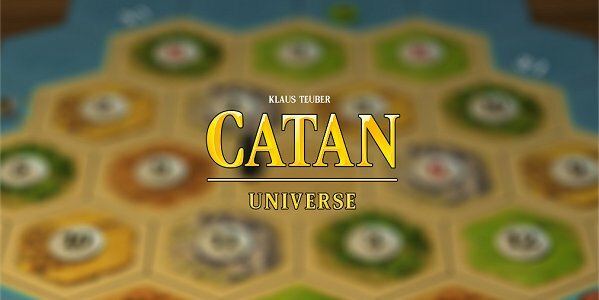 Now if you want to play Catan, you will have one account and can access the game on iOS, Android, Steam, Amazon and browser at Catan Universe. This is a great idea. Now I can easily access the game anywhere and I do not need to purchase different copies for different platforms. I tested the game on Steam for this posting. When you first begin, you will need to setup your profile. The game provides a new tutorial on how to do this and will help walk you through it. You will also create your avatar and you will have tons of options. Under your profile you can modify your avatar, check out your statistics, see what expansions you own, etc. You can also join a guild, connect with friends, access a Catan Almanac, change the graphic and sound options. Now on the top right hand corner is a link to the shop. Here you can purchase Catan gold. This in game currency can be used to purchase more expansions, different avatars, scrolls, and bundle packs. Now the game is free to download and play, but you will need Catan gold to unlock the base game forever and any of the expansions. I am not sure how you earn gold in the game but from what I have read only, you will probably need to invest some real money into the game. Right now Catan Universe includes the Catan board game, the Cities and Knights and Seafarers expansions and the card game Rivals for Catan. A brand-new game version Catan – Rise of the Inkas will be available from fall 2018. My thoughts on the game. The graphics on the PC are ok, it took me a bit of figuring out what the best options were for my system. I have some concerns how it will play on a mobile device. I think it might be too much for a phone but could work on a tablet. The speed and smoothness of the game was ok, again it seemed a bit choppy for me. The in game chat is a bit clunky too. Also the in-game gold/shop does not have much explanation to it so takes some time to figure it out. Overall I like the idea behind Catan Universe and will curious to see how it grows, improves, and expands. If you are a Catan player, download the game and see if you enjoy the new experience.